Explore local patterns of diphtheria, pertussis and tetanus (DPT) vaccination coverage across Africa from 2000 to 2016 with this interactive visualization tool. Explore local patterns of diarrhea burden across Africa from 2000 to 2015 with this interactive visualization tool. 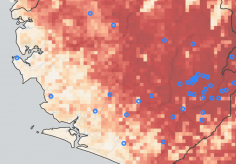 Compare diarrheal prevalence, incidence, and mortality at multiple spatial scales – from values at the country level to estimates for individual districts and departments. Search for specific areas to view local trends, and share your findings with others. Observe temporal patterns of improvement, and examine the probability of achieving the WHO Global Action Plan for Pneumonia and Diarrhea (GAPPD) goals. With this interactive map visualization, explore local patterns in educational attainment across 51 African countries from 2000 to 2015. Compare how years of education vary between men and women and across two different age groups. Observe trends at multiple spatial scales and search to view trends in specific countries and local areas. 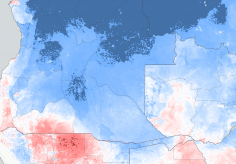 With this dynamic map visualization tool, explore local patterns in child stunting, wasting, and underweight within 51 African countries from 2000 to 2015. Observe trends at multiple spatial scales and search to view trends in specific countries and local areas. With this interactive mapping tool, explore local assessments of where in Africa specific infectious diseases (Ebola virus disease, Marburg virus disease, Lassa fever, and Crimean-Congo hemorrhagic fever) have the greatest potential to emerge and subsequently spread. 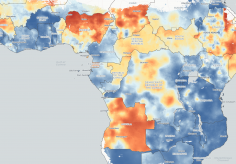 With this interactive mapping tool, explore localized child and infant mortality trends within 46 countries in Africa from 2000 to 2015. 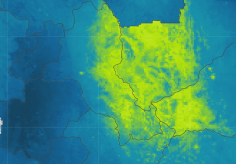 View trends at different spatial resolutions and examine change over time and the improvement rates needed to achieve the United Nations Sustainable Development Goal for child mortality. Search to view trends in specific countries, districts, and local areas. Easily share maps with others.